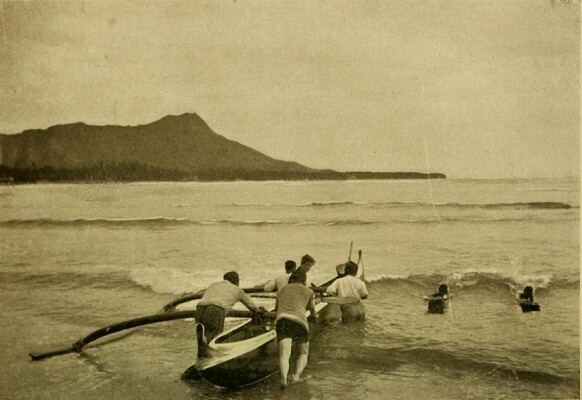 Mabel Clare Craft : Surf Canoeing at Waikiki, 1899. W. Doxey, San Francisco, 1899. On moonlight nights most delightful bathing-parties are given at the villas of Waikiki. The great amusement is not so much dipping in the surf, though every one swims like a fish, but canoeing. Many people have their own canoes, and there are boats to be hired, with natives to guide them. The canoes are built on the old Hawaiian model, which could not well be improved upon. Each one is hollowed from a single trunk, and I have skimmed the surf in a canoe in which the great Kamehameha himself went avoyaging. There is an outrigger of heavy wood to give steadiness, and the paddles are huge, flat wooden spoons. who live by the water have learned the difficult art of steering. It is a most delightful sport, though timid people do not enjoy it. It has in it that spice of danger which charms. The canoe-riders all wear bathing-suits, for it is as wet inside the boat as outside. Unless the canoe is extraordinarily large, not more than two passengers who do not work can be carried. As a consequence, some of the ladies at Waikiki have learned to be expert oarswomen. The canoe is pushed off from the shelving shore and paddled out toward the reef, over which the tide rolls in big breakers, the bigger the better. Too much wind blowing off shore spoils the sport, as it prevents the canoe from attaining sufficient momentum. All hands paddle going out, and presently, about a quarter of a mile from shore, the rowers turn the canoe, and wait for a huge roller. Sometimes when the surf runs high, even the outward-going is exciting. The canoe goes over big incoming breakers, and drops squarely down to the level water with something of the shock of the chutes. Two or three rollers may pass the canoe before one is selected. It is chosen far out, and the helmsman gives the signal, " Hoi ! hoi!''' which means to paddle like mad. The rowers bend to the paddles, and the firm, quick strokes, send the canoe bounding forward while the motion thrills the bark as the wind thrilled it long ago, when it was a young tree in the forest. All this effort is to give the boat sufficient momentum to keep up with the wave when the latter shall have finally caught up with its freight. To be in a careening boat with a heavy outrigger that has a way of knocking innocent people on the head is not agreeable, nor is it fun to have to swim in with the waterlogged canoe, sometimes a task of several hours. Those who cannot swim must sit in the canoe and add their weight to that of the water. But if the canoe is going fast enough, none of these disagreeable contingencies occur. The wave, fresh from its victorious fight with the reef, rises behind in a great green translucent wall, curling white at the top, as though to show its teeth. From far below it, you look up into it fascinated. There is a moment of breathless suspense, and then the canoe is lifted up and flung forward with incredible speed. It is like sliding downhill over water instead of land, and there is all the fancied pleasure of drowning with none of its pangs. It is one long toboggan to the shore. Once or twice, if the paddlers with their wonderfully sympathetic water-sense feel the boat slackening, they give a vigorous push or two and the canoe is again coasting down the wave. In front, where the canoe cuts the water, a blinding sheet of spray is thrown upward and backward, and the two cowcatcher seats are all afloat. But the steersman has no sinecure. With his paddle he must guide this long canoe, which is not an easy task, considering that the wave has several motions, and does not travel in a straight line. If he feels a rotary motion inside the circling water, he must correct it with his paddle. He is obliged to shift the paddle from side to side of the boat, and he must do it with swiftness and certainty. A second's indecision on his part would capsize the canoe. swerving in this maelstrom of waters. Borne on irresistibly, the canoe is carried to the shore, and then the paddlers bend to their task once more, and the exhilarating run is made over again. The enjoyment is heightened when there are three or four canoes out, all in experienced hands. They race on every incoming wave, and as the wave does not run at the same speed in all places, there is a fair chance for one canoe to shoot in ahead of the others. If the wave dies out at one point, or if one of the canoes is left in the rear, a derisive shout goes up from the rest. This is sea-racing in a new form, with nature to do the work. Their small families and high death-rate are the direct cause of the decline in the native population. The natives are much more industrious than we give them credit for. Nearly all of them work. They cultivate taro, they clerk in stores, they fish, they row boats, and they guide canoes through the surf for the pleasure of visitors to the islands. The industry of the natives is largely a habit contracted from the whites. In the old days amusement was the thing and work was only secondary. But American methods put a stop to all this Arcadian vagabondage. Native boat-crews work until the perspiration flows down their faces, rowing the heavy canoes through the surf at the many landings. They are at it early and late, at a wage of a dollar a day, and even then they are so generous that they invite all the steerage passengers who are without provisions to share with them their rations of fish and poi, until frequently their store gives out before the end of the voyage, and they must do their hard work on empty stomachs. And the extreme cheerfulness with which they do their work! Life for them is seasoned with smiles. My boatman, Picoi, bending his fine brown back and straining his marvelous arms that I may have the joy of riding down hill on a breaker, smiles through the sweat that drips in his eyes because I call him, "Picoi, good boy." He is a revelation of willing service. The famous road to Waikiki is in the other direction from the Pali, a long, level, well-made causeway, ideal for bicycling, and with Kapiolani Park, Sans Souci, or Diamond Head as objective points. It is a fine climb- into the ashy crater of Diamond Head, with a magnificent reward for the fatigue. All along the Waikiki sands are hospitable villas and splendid beaches, where the bathing is the best in the world. I know a cabinet where the lower jaw of a fine young brave, every tooth white and perfect, is one of the treasures. This was a find on this very beach at the foot of Diamond Head. The bay (at Hilo) is the most beautiful harbor in all Hawaii. As elsewhere, there is no wharf, and landings to and from the little steamers must be made in small boats. Around the bay is a bold headland crowned with green, and the water of the bay is an exceedingly clear and limpid emerald. Hilo has a number of show places. coves where the water is a paler green, and where bathers come to have the novel experience of bathing in warm salt water while taking a cold shower in rain water from above, for it always rains in the bathing-pool. An island Charon ferries you across to Cocoanut Isle, and assures you that there are "not very many sharks" as he grates the prow of his boat against a rock. You bathe in the cocoanut cove, but with some misgivings, for a melancholy row of sharks' skulls with quadruple rows of indented teeth attest to the fact that there have been sharks at no remote period. The drive to and from Cocoanut Isle is delightful, across the wide Wailuku River, through lanes bordered with delicious wild strawberry guavas, which the natives do not even take the trouble to gather. On the other side of the town are the Rainbow Falls, within easy riding or walking distance. As a walk it is very charming. The road is lumpy and invariably muddy, and almost impassable for wheeled vehicles, but fine for a short skirt and stout shoes. There are rippling little streams to cross on foot-bridges where it is pleasant to sit and dangle your feet and eat pineapples from the neighboring field. Behind the hospital, down a steep little ravine, is a spring that gushes pure and cold from the mountain. This is one of the finest, because it is the coldest, in all Hawaii. It was for centuries a tabu spring, sacred to the use of the high chief of this district. No common man was allowed to slake his thirst there. If one ever did, it was in the dead of night and at the peril of his life, for the tabu sticks of white kapa guarded the place day and night. I have selected the story of Hiku and his rescue of his dead love, which is the Hawaiian version of Orpheus and Eurydice, as a typical Hawaiian wonder-tale. Whenever it became necessary to get new shells from the seashore to scrape the kapa, or when great piles of the finished stuff were ready for exchange, Hana would go down the mountain to barter her wares for fish and taro and seaweed and shells. On these occasions she never allowed Hiku (her son) to accompany her, though he begged hard to go. He had been born on Hualalai, and he had never been to the seashore. To tell the truth, Hana was jealous of Hiku. She wanted him to stay with her always, and she feared that if he once went down to the village and found how merry they were there, bathing, swimming, and skimming the waves on surf-boards, he would never want to dwell on Hualalai' s lonely heights again. as the great mallets came down on the tree-fiber with a cadence like a chorus of anvils. And Hiku, who had been restless for days, suddenly sprang to his feet, and tightening his malo, declared that he was going down to the village, and see what they did with the drums under the moon. And though Hana hung about his neck and caressed him, weeping piteously and begging him to stay, he would not be restrained, and started out, and the best that she could do was to win his promise that he would come back some day. And for days and days, the sound of Hana's wailing could be heard through the forest, and her mallet was silent. Hiku was wild with delight to see a whole street of grass houses, instead of a single hut, and it was very much warmer on the seashore than on the cold mountain- top. The slender stems of the cocoanuts bent in the wind, and Hiku soon learned to run up them with monkey-like agility, and to gather the green fruit. delightful to dive among the coral groves of the reef, and Hiku soon added diving and swimming to his accomplishments. And while Hana mourned in the mountain, Hiku was perfectly happy, and rarely thought of his old home. Geoff Cater (2012) : Mabel Clare Craft : Hawaii Nei, 1899.